Pinscher is German for terrier. Fearless, loyal and intelligent, Dobermans have been bred to be ideal watch dogs. With sleek, muscular bodies, Doberman pinschers certainly look intimidating. In the hands of an irresponsible owner, they can become aggressive and stubborn; however, in the right hands, they are loving, friendly dogs. Doberman pinschers were originally bred in Germany at the turn of the 20th century. They were the brain-child of tax collector Louis Dobermann, who wanted a dog that would not only make a good guard dog, but a loyal companion. The Doberman fits the bill. They are easily recognized by their lean, muscular frame and black and brown coloration similar to a Rottweiler's. Their ears and tails are often docked, giving them tall, pointy ears and a short, stubby tail. 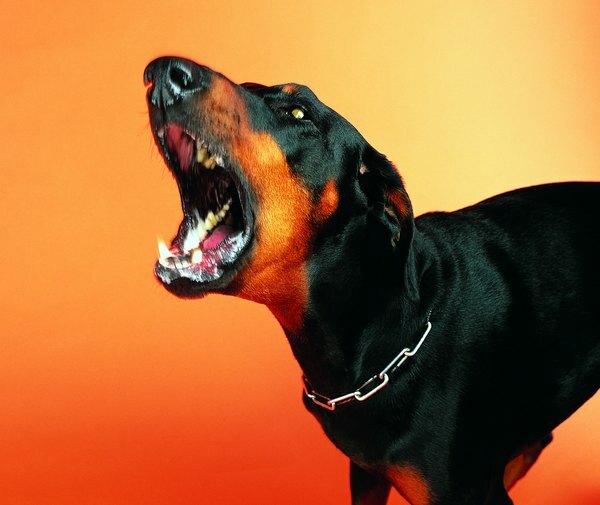 Despite their intimidating appearance, Dobermans aren’t particularly aggressive. They are more likely to be aggressive toward strange dogs, people and almost never aggressive towards their owners. Aggression is usually a product of poor socialization or lack of training. Dobermans are fiercely attached to their owners and crave attention all the time. These are not dogs to be left alone in a back yard or cramped in a crate for long periods of time. It’s important the dog views you as his master. With a strong leader, training and plenty of love, Dobermans are excellent family pets who aren’t aggressive. The key to having a friendly Doberman is the same as with any dog -- socialization. Dobermans are shy around strangers, and should be introduced to new people, dogs and other pets from puppyhood. This will teach them that friendly behavior is desired and likely prevent any aggression from arising. Puppies who get left alone, are yelled at frequently or are simply not trained to be well-behaved are likely candidates for showing aggression. Dobermans are extremely intelligent and easily trainable, so a few obedience classes and training as a puppy will go a long way. Dobermans aren’t right for everyone. They require a lot of time and dedication. If you have small children, younger than around 10 years old, a Doberman probably isn’t the best choice. 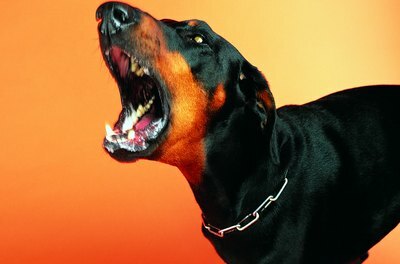 Screaming children can teach a Doberman puppy to be afraid of kids or adults. Typical puppy behavior could frighten kids and lead to the dog getting punished or penned up, which can lead to an aggressive dog. Dobermans are best suited for experienced dog owners who are looking for a dog who wants to be attached at the hip. They need a firm hand and opportunities to be challenged with lots of interactive play.